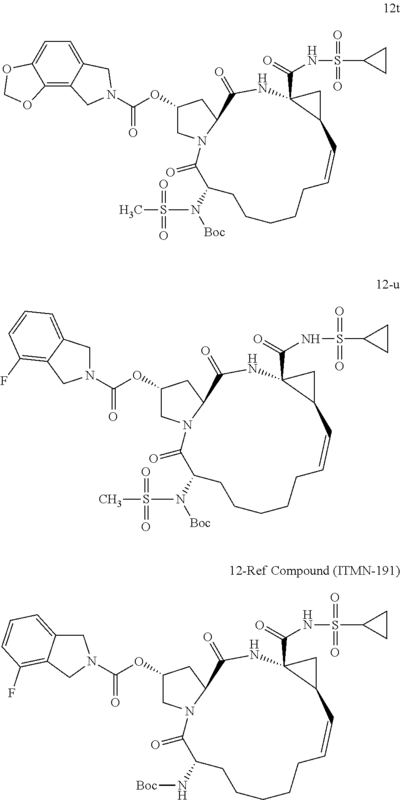 ITMN-191 (R-7227), a macrocyclic protease inhibitor, is in phase II clinical evaluation for the treatment of chronic hepatitis C virus (HCV) infection as monotherapy and in combination with Pegasys(R) (pegylated interferon alpha-2a) and Copegus(R) (ribavirin). The product candidate is also being evaluated in combination with R-7128 in treatment-naive patients infected with HCV genotype 1. 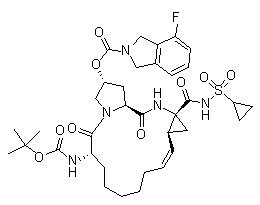 Danoprevir (ITMN-191; RG-7227), under development by InterMune Inc and Roche Holding AG, is a promising, potent NS3/4A protease inhibitor for the oral treatment of HCV infection. Preclinical data demonstrated that danoprevir binds with high affinity and dissociates slowly from the HCV NS3 protease, allowing high liver drug exposure with only modest plasma drug exposure. In 2006, originator InterMune and licensee Roche entered into an exclusive worldwide collaboration agreement to develop and commercialize products from InterMune’s hepatitis C (HCV) protease inhibitor program, including ITMN-191. In 2010, the licensing agreement was terminated. Also in 2010, Roche acquired worldwide development and commercialization rights to R-7227 from InterMune. Preclinical pharmacokinetic results support the exploration of twice-daily oral dosing in HCV. 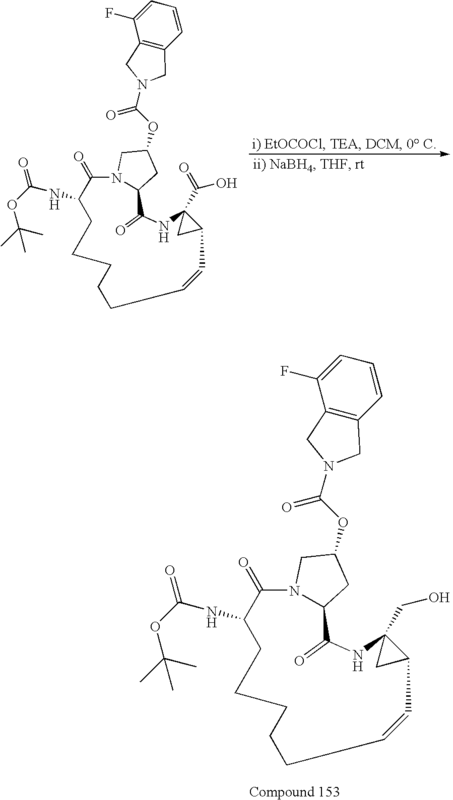 inhibitor of the NS3/4A protease of hepatitis C virus (HCV) with IC50 of 0.2-3.5 nM, inhibition effect for HCV genotypes 1A/1B/4/5/6 is ~10-fold higher than 2B/3A. Phase 2. 13. Discovery of novel urea-based hepatitis C protease inhibitors with high potency against protease-inhibitor-resistant mutants. Kazmierski WM, Hamatake R, Duan M, Wright LL, Smith GK, Jarvest RL, Ji JJ, Cooper JP, Tallant MD, Crosby RM, Creech K, Wang A, Li X, Zhang S, Zhang YK, Liu Y, Ding CZ, Zhou Y, Plattner JJ, Baker SJ, Bu W, Liu L.
J Med Chem. 2012 Apr 12;55(7):3021-6. doi: 10.1021/jm201278q. Epub 2012 Apr 3. 14 . 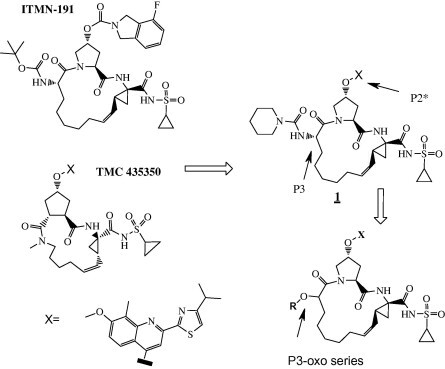 Discovery of novel P3-oxo inhibitor of hepatitis C virus NS3/4A serine protease. Duan M, Kazmierski W, Crosby R, Gartland M, Ji J, Tallant M, Wang A, Hamatake R, Wright L, Wu M, Zhang YK, Ding CZ, Li X, Liu Y, Zhang S, Zhou Y, Plattner JJ, Baker SJ. Bioorg Med Chem Lett. 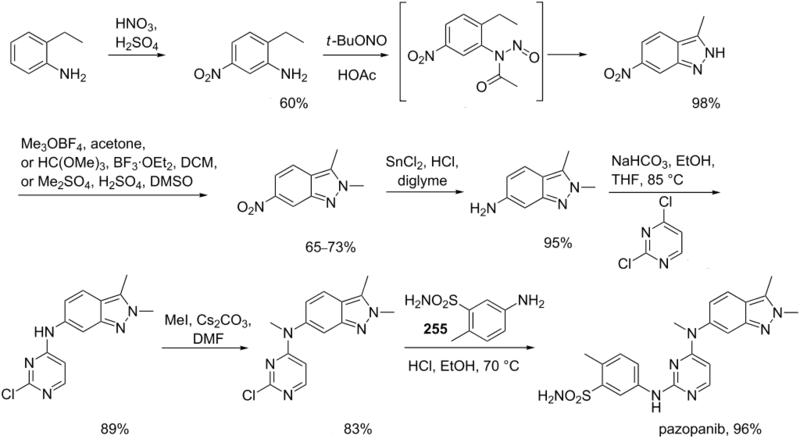 2012 Apr 15;22(8):2993-6. doi: 10.1016/j.bmcl.2012.02.039. Epub 2012 Feb 22. 1H NMR (500 MHz, acetone-d6) δ 10.70 (br s, 1 H), 8.34 (d, 1 H), 7.39–7.33 (m, 1 H), 7.20 (d, 1 H), 7.10–7.02 (m, 2 H), 6.13 (d, 1 H), 5.70 (q, 1 H), 5.44 (br s, 1 H), 4.99 (t, 1H), 4.78–4.59 (m, 5 H), 4.18–4.08 (m, 1 H), 3.88–3.81 (m, 1 H), 2.86–2.78 (m, 3 H), 2.71–2.60 (m, 1 H), 2.52–2.35 (m, 3 H), 1.92–1.81 (m, 2 H), 1.75 (t, 1 H), 1.61–1.14 (m, 17 H), 1.04–0.95 (m, 2 H). 13C NMR (DMSO-d6, 100 MHz) δ174.0, 172.3, 170.8, 157.5 (d, J = 244 Hz), 155.8, 154.0, 140.9 (d, J = 64.8 Hz), 130.6, 130.2, 129.6, 123.8 (d, J = 55.7 Hz), 119.6, 114.4 (d, J = 18.3 Hz), 78.4, 74.7, 59.7, 53.4, 52.7, 52.4, 49.4 (d, J = 37.1 Hz), 44.6, 34.9, 31.8, 30.4, 28.8, 28.6, 27.0, 25.7, 22.6, 4.8. APCI MS m/z730.4 (M – 1). Example 58 Synthesis of Compound 12-RefCompound 11-Ref (0.18 mmol) was dissolved in 10 mL anhydrous dichloromethane, EDCI (69.8 mg, 0.36 mmol, 2 eq.) was added and stirred at room temperature overnight until completed. The reaction mixture was worked out and concentrated.The obtained solid was dissolved in 10 mL of anhydrous dichloromethane, DBU (61.0 mg, 0.40 mmol) and RSO2NH2 (0.363 mmol, R=cyclopropyl) were added and stirred at room temperature overnight until completed. The reaction mixture was worked out and purified by flash column to obtain the product 12-Ref (62 mg; Yield: 53%).1H-NMR for the product 12-Ref (CDCl3, 500 MHz): δ 10.28-10.29 (d, 1H), 6.87-7.07 (m, 3H), 5.72-5.74 (m, 1H), 5.48 (br , 1H), 4.99-5.03 (m, 2H), 4.58-4.79 (m, 5H), 4.42 (m, 1H), 4.21 (m, 1H), 3.83-3.85 (m, 1H), 2.90-2.93 (m, 1H), 2.48-2.57 (m, 3H), 2.27-2.30 (m, 1H), 1.88-1.97 (m, 2H), 1.67-1.79 (m, 2H), 1.45-1.58 (m, 6H), 1.34 -1.40 (m, 2H), 1.27 (s, 4H), 1.24 (s, 5H), 1.08-1.15 (m, 2H), 0.91-0.94 (m, 1H). ESI-MS (M+H+): m/z calculated 732.3, founded 732.5. 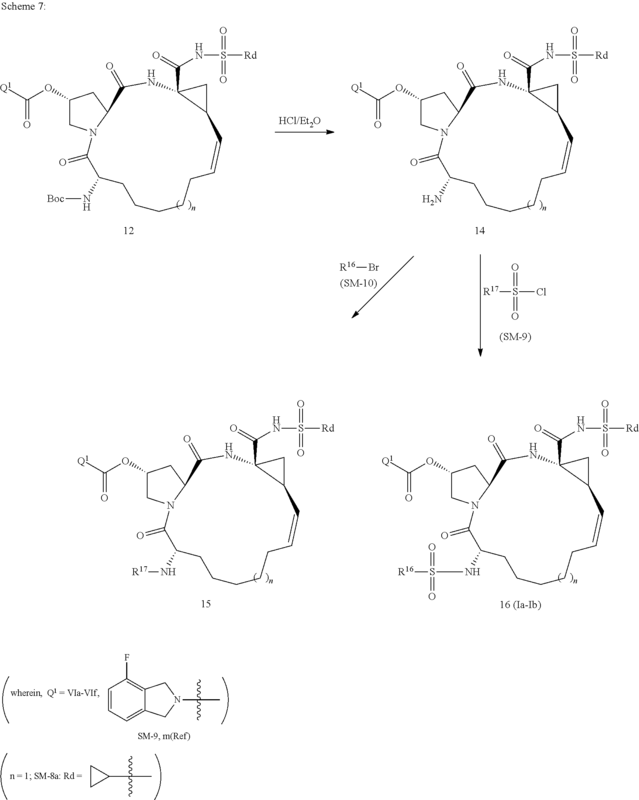 (2R,6S,13aS,14aR,16aS,Z)-6-(tert-botoxycarbonylamino)-2-(4-fluoroisoindoline-2-carbonyloxy)-5,16-dioxo-1,2,3,5,6,7,8,9,10,11,13a,14,14a,15,16,16a-hexadecahydrocyclopropa[e]pyrrolo[1,2-α][1,4]dizacyclopentadecine-14a-carboxylic acid (0.10 g, 0.16 mmol) and TEA (0.024 mL, 0.18 mmol) in THF (5 mL) was added ethyl carbonochlridate (0.016 mL, 0.17 mmol) at 0° C. The reaction was stirred at 0° C. for 2 hrs. Sodium boronhydride (0.012 g, 0.32 mmol) was added and the reaction was stirred at rt for 3 days. Water (5 mL) and ethyl acetate (10 mL) were added. The organic layer was separated, washed with brine and dried over sodium sulfate. After removal of solvent, the residue was purified by column chromatography (ethyl acetate) to give the product (0.060 g, 61.4%) as white solid. 1H NMR (400 MHz, d6-DMSO) δ 8.47 (b, 1H), 7.35 (m, 1H), 7.10-7.20 (m, 2H), 7.03 (m, 1H), 5.47 (m, 1H), 5.28 (b, 1H), 4.98 (m, 1H), 4.67 (b, 4H), 4.56 (m, 1H), 4.46 (m, 1H), 4.26 (m, 1H), 3.92 (m, 1H), 3.66 (m, 2H), 3.16 (m, 1H), 2.67 (m, 1H), 2.21 (m, 2H), 1.80 (m, 1H), 1.68 (m, 1H), 1.30 (m, 8H), 1.11-1.20 (m, 9H), 0.85 (m, 1H), 0.77 (m, 1H). A solution of oxalyl chloride 90.045 mL, 0.089 mmol) in DCM (5 mL) at −78° C. was added a solution of DMSO (0.015 g, 0.020 mmol) in DCM (2 mL) dropwise over 2 ninytes. 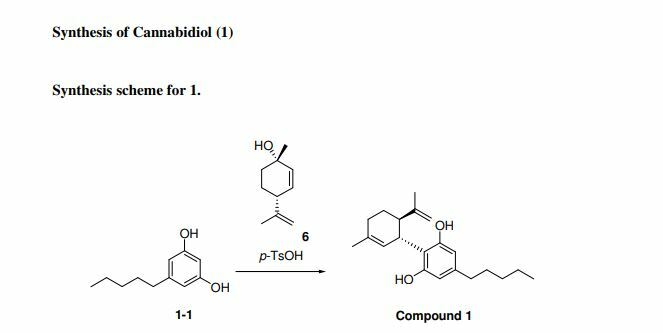 The reaction was stirred at −78° C. for 10 minutes and the a solution of (2R,6S,13aS,14aR,16aS,Z)-6-(tert-botoxycarbonylamino)-14a-(hydroxymethyl)-5,16-dioxo-1,2,3,5,6,7,8,9,10,11,13a,14,14a,15,16,16a-hexadecahydrocyclopropa[e]pyrrolo[1,2-α][1,4]dizacyclopentadecin-2-yl-4-fluoroisoindoline-2-carboxylate (0.050 g, 0.081 mmol) in DCM (2 mL) was added. After stirred at −78° C. for 40 min, TEA (0.051 mL, 0.37 mmol) was added. The reaction was warmed to rt, water (5 mL) was added. The organic layer was separated, washed with brine and dried over sodium sulfate. After removal of solvent, the residue was dissolved in MeOH (5 mL) and ammonium hydroxide (0.085 g, 2.45 mmol) and acetic acid (0.014 mL, 0.25 mmol) were added. The reaction stirred at rt for 3 minutes. NaCNBH3 90.015 g, 0.245 mmol) was added and stirred at rt for 30 minutes. The MeOH was removed. DCM (20 mL) and saturated sodium bicarbonate (5 mL) was added. The organic layer was separated, washed with brine and dried over sodium sulfate. After removal of solvent, the residue was dissolved in DCM (5 mL). 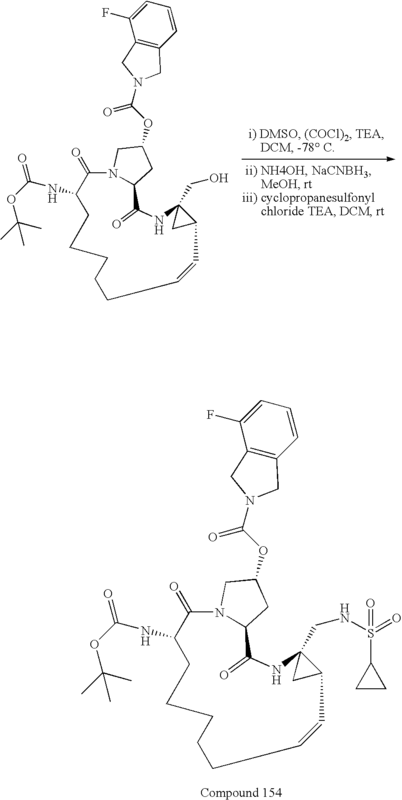 TEA (0.017 mL, 0.122 mmol) was added and followed by the cyclopropanesulfonyl chloride (0.015 g, 0.098 mmol). The reaction was stirred at rt for 5 hrs. The solvent was removed. The residue was purified by column chromatography (ethyl acetate) to give the product (0.017 g, 28.2%) as white solid. 1H NMR (400 MHz, d6-DMSO) δ 8.52 (m, 1H), 7.35 (m, 1H), 7.02-7.20 (m, 4H), 5.56 (m, 1H), 4.99 (m, 1H), 4.97 (m, 1H), 4.67 (m, 2H), 4.66 (s, 2H), 4.46 (m, 1H), 4.24 (m, 1H), 3.92 (m, 1H), 3.67 (m, 1H), 3.46 (m, 1H), 2.74 (m, 1 h), 2.67 (m, 1H), 2.22 (m, 2H), 1.84 (m, 1H), 1.68 (m, 1H), 1.08-1.36 (m, 20H), 0.89 (m, 2H), 0.81 (m, 2H). Hoffmann-La Roche and Genentech’s danoprevir/r (RG7227) is a twice-daily, ritonavir-boosted HCV protease inhibitor with activity against HCV genotypes 1, 4 and 6. DAUPHINE, an ongoing phase II trial in 421 treatment-naive people with HCV genotypes 1 and 4, is comparing doses (200, 100, and 50 mg danoprevir, boosted with 100 mg ritonavir, twice-daily) and response-guided therapy with danoprevir/r plus PEG-IFN/RBV. At 12 weeks after treatment completion, HCV RNA was undetectable in 86% of the highest-dosing arm, 77% of the 100 mg arm, and 65% of the 50 mg arm. Response to treatment in the 200 mg dosing arm did not differ according to HCV subtype or IL28B genotype; at 12 weeks after treatment completion, 88% of people with HCV subtype 1a and an IL28B non-CC genotype had undetectable HCV RNA. Across all dosing arms, HCV RNA remained undetectable 12 weeks after treatment completion in 100% of people with HCV genotype 4. In the response-guided therapy arm, 76% of early responders (who were treated for 12 weeks) and 67% of late responders (treated for 24 weeks) maintained undetectable HCV RNA 12 weeks after treatment completion, bringing the overall total to 72%. One death occurred during the trial—from sudden heart attack, in a participant with preexisting diabetes and hypertension—it was considered unrelated to study drugs. Adverse events were reported in virtually all study participants. Side effects from ritonavir, which is used to boost danoprevir levels, increased the likelihood of more than one serious adverse event among people in the danoprevir/r arms (range 4–9% vs. 1% for placebo). The rate of danoprevir/r-related treatment discontinuations was similar to the rate of PEG-IFN/RBV-associated discontinuations (3–7%, and 3–8%, respectively). Common side effects (experienced by more than 15% of study participants) included fatigue, fever, chills, weakness, nausea, diarrhea, itching, rash, hair loss, headache, aching muscles and joints, insomnia, cough, and appetite loss. Diarrhea was the only side effect associated with danoprevir/r. Adding danoprevir/r did not increase rates of rash or anemia (known side effects of other HCV protease inhibitors). Most grade 3 and grade 4 lab abnormalities were neutropenia, reported in 22% to 38% of study participants. Roche’s phase IIb study, INFORM-SVR, is combining response-guided therapy with danoprevir/r, a twice-daily ritonavir-boosted HCV protease inhibitor, and mericitabine, a twice-daily nucleoside polymerase inhibitor, with or without ribavirin for 12 to 24 weeks in non-cirrhotic people with HCV genotype 1. The original study design was modified after high relapse rates were observed in the 12-week treatment and ribavirin-free arms. Treatment was extended to 24 weeks, and ribavirin was given to all participants. The majority of INFORM-SVR participants were male, had HCV genotype 1a, and non-CC genotypes. Of the 64 people treated for 24 weeks with all three drugs, 41% experienced SVR-12. People with HCV genotype 1b were more likely to achieve SVR-12 (71% versus 26% in HCV genotype 1a). In contrast, SVR-12 was more likely among people with non-CC genotypes (32% for CC versus 44% for non-CC), although only 4 people had HCV genotype 1b and CC genotype. Breakthrough rates were higher in people who did not receive ribavirin, and in HCV genotype 1a versus 1b. Resistance to danoprevir/r was observed in all patients who experienced viral breakthrough; mericitabine resistance was found in one person. Almost all participants had more than one adverse event; a total of 567 mild-to-moderate events were reported among 83 people. The most common side effects, occurring in >10% of people were headache, fatigue, nausea, diarrhea, colds, insomnia, itching, weakness, dizziness, irritability, shortness of breath, cough, upset stomach, painful joints, and vomiting. As for laboratory abnormalities, one person experienced grade 3 anemia, four people had grade 3 lipid elevations, and one case each of grade 3 elevations in phosphate and lipase were observed. A single serious adverse event, multiple myeloma, occurred 53 days after treatment completion and one person discontinued due to pain in the back of the throat (it was not specified whether or not this was a treatment-related adverse event). (Achillion), ACH-1625 (Achillion), ACH-2684 (Achillion), AVL-181 (Avila), AVL-192 (Avila), BI-201335 (Boehringer Ingelheim), BMS-650032 (BMS), boceprevir, danoprevir, GS- 9132 (Gilead), GS-9256 (Gilead), GS-9451 (Gilead), IDX-136 (Idenix), IDX-316 (Idenix), IDX- 320 (Idenix), MK-5172 (Merck), narlaprevir, PHX-1766 (Phenomix), telaprevir, TMC-435 (Tibotec), vaniprevir, VBY708 (Virobay), VX-500 (Vertex), VX-813 (Vertex), VX-985 (Vertex), or a combination thereof. 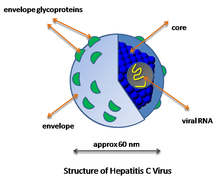 Non-limiting examples of suitable HCV polymerase inhibitors include ANA-598 (Anadys), BI-207127 (Boehringer Ingelheim), BILB-1941 (Boehringer Ingelheim), BMS-791325 (BMS), filibuvir, GL59728 (Glaxo), GL60667 (Glaxo), GS-9669 (Gilead), IDX-375 (Idenix), MK-3281 (Merck), tegobuvir, TMC-647055 (Tibotec), VCH-759 (Vertex & ViraChem), VCH-916 (ViraChem), VX-222 (VCH-222) (Vertex & ViraChem), VX-759 (Vertex), GS-6620 (Gilead), IDX-102 (Idenix), IDX-184 (Idenix), INX-189 (Inhibitex), MK-0608 (Merck), PSI-938 (Pharmasset), RG7128 (Roche), TMC64912 (Medivir), GSK625433 (Glaxo SmithKline), BCX-4678 (BioCryst), ALS-2200 (Alios BioPharma/Vertex), ALS-2158 (Alios BioPharma/Vertex), or a combination thereof. 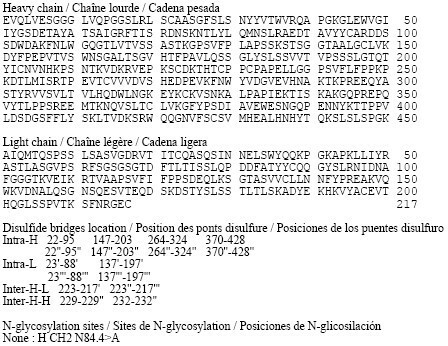 A polymerase inhibitor may be a nucleotide polymerase inhibitor, such as GS-6620 (Gilead), IDX-102 (Idenix), IDX-184 (Idenix), INX-189 (Inhibitex), MK-0608 (Merck), PSI-938 (Pharmasset), RG7128 (Roche), TMC64912 (Medivir), ALS-2200 (Alios BioPharma/Vertex), ALS-2158 (Alios BioPharma/Vertex), or a combination therefore. A polymerase inhibitor may also be a non- nucleoside polymerase inhibitor, such as ANA-598 (Anadys), BI-207127 (Boehringer Ingelheim), BILB-1941 (Boehringer Ingelheim), BMS-791325 (BMS), filibuvir, GL59728 (Glaxo), GL60667 (Glaxo), GS-9669 (Gilead), IDX-375 (Idenix), MK-3281 (Merck), tegobuvir, TMC-647055 (Tibotec), VCH-759 (Vertex & ViraChem), VCH-916 (ViraChem), VX-222 (VCH-222) (Vertex & ViraChem), VX-759 (Vertex), or a combination thereof. Non-limiting examples of suitable NS5A inhibitors include GSK62336805 (Glaxo SmithKline), ACH-2928 (Achillion), AZD2836 (Astra-Zeneca), AZD7295 (Astra-Zeneca), BMS-790052 (BMS), BMS- 824393 (BMS), GS-5885 (Gilead), PPI-1301 (Presidio), PPI-461 (Presidio), or a combination thereof. Non-limiting examples of suitable cyclophilin inhibitors include alisporovir (Novartis & Debiopharm), NM-811 (Novartis), SCY-635 (Scynexis), or a combination thereof. Non-limiting examples of suitable HCV entry inhibitors include ITX-4520 (iTherx), ITX-5061 (iTherx), or a combination thereof. By DR ANTHONY MELVIN CRASTO Ph.D in Phase2 drugs on January 9, 2014 .